Hopefully I should be back to normal in few days and start my regular cooking. Have to thank my mom and cousin sister who took great care of me all these days. I really feel blessed with the beautiful people around and have to thank few of my blogger friends too who encouraged me with their supportive words when I was down and completely lost. The one which I missed a lot all these days is SNC Challenge by divya pramil. Every 1st of month will be very interesting and excited to know our challenge recipe.. Time really flies and its been one year now…And am really very proud and happy to be part of this group. Her recent celebration post was so inspirational to try out all missed out recipes… Really wanted to try all my missed out recipes so far from both teams but unfortunately my health did not co-operate. 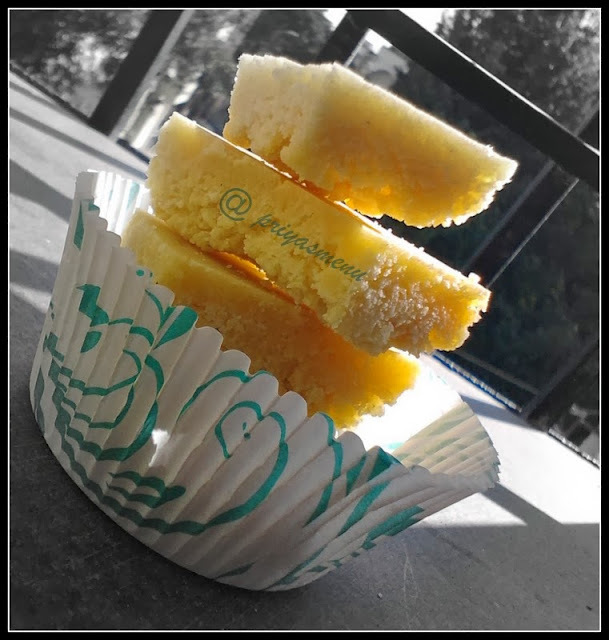 Still I did not want to miss the golden opportunity so tried the ever first snc challenge and sweet recipe “mysore pak” from divya’s culinary kitchen. It’s a south Indian recipe but still I wanted to try it out for my hubby who loves this sweet very much. Hope to continue my challenge from this month.... Thanks all for being so kind and I request you all to continue the same support as you all did. 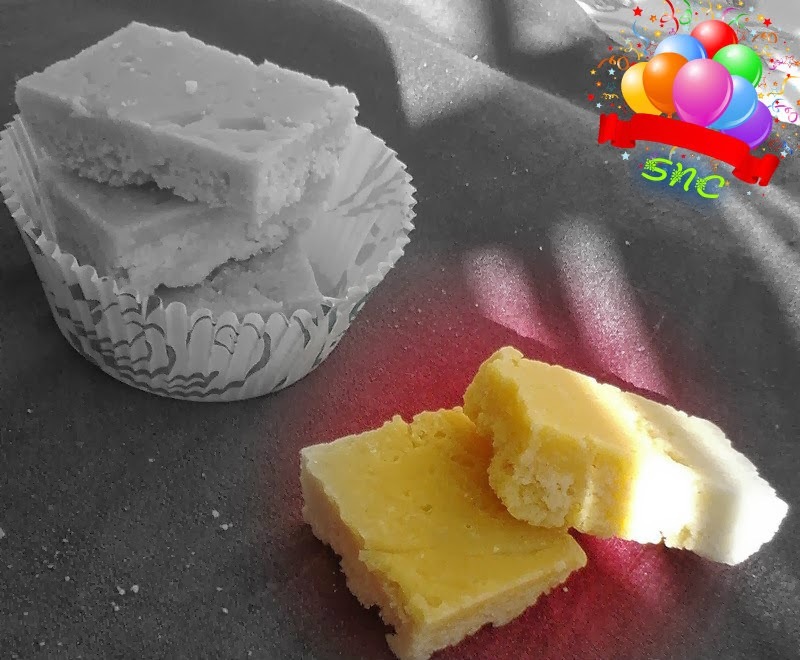 Happy Anniversary "SNC" and its celebration Time with Yummy melting Mysore Pak ! Grease the plate with ghee and keep aside. Mix oil and besan without any lump. In a pan, mix sugar and water. Boil them to get the required consistency of syrup. When you drop syrup in a bowl of water, the syrup should not get dissolved. Now add the besan mixture to the sugar syrup and mix well. Stir continuous to avoid the formation of lumps. Add ghee little by little and continue stirring till the mixture changes in texture and color. And the mixture should start leaving the edges. Transfer the mixture to the greased plate and cut in to desired shape when it is warm. Cool and store it in a air tight container. Are you interested in participating in our SNC family....?? 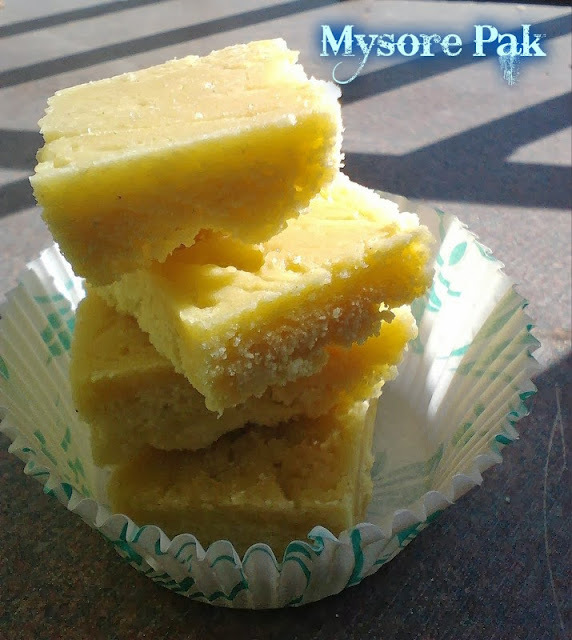 thanks for dropping by at my space, nice to discover ur blog too..Mysore pak looks scrumptious. Wow! Looks yumm n my fav..